I had two chicken breasts with an expiring ‘use by’ date in my fridge. And I have an unused Betty Bossi cookbook with poultry recipes only on my bookshelf. Lucky me! I chose the pollo tonnato recipe which is an adaptation of the popular Italian staple vitello tonnato, veal in tuna sauce. 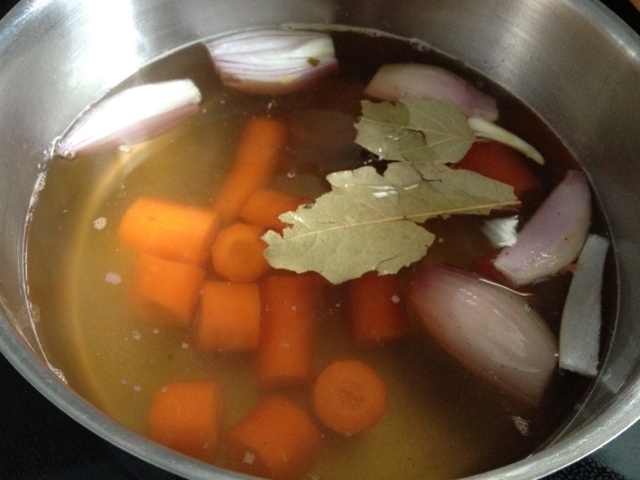 First you poach the chicken breasts in vegetable broth with 2-3 carrots, 1-2 shallots and 1-2 laurel leaves. This takes about 20 minutes. 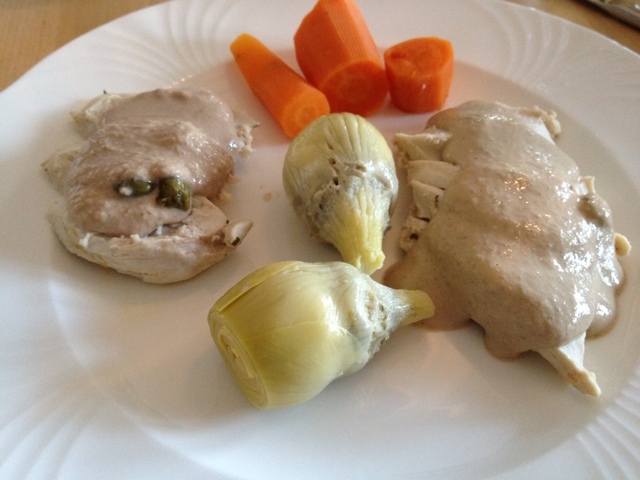 While the chicken is happily swimming in the broth, you have time to prepare the tuna sauce. You start off by making a mayo base. 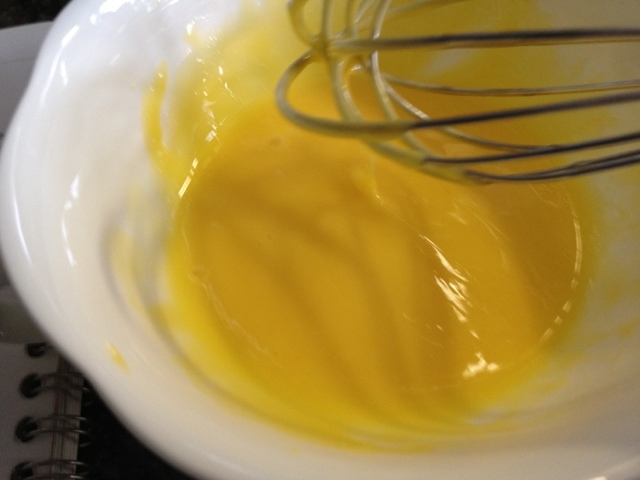 For this you need to whisk 1 egg yolk together with 1 tablespoon lemon juice. 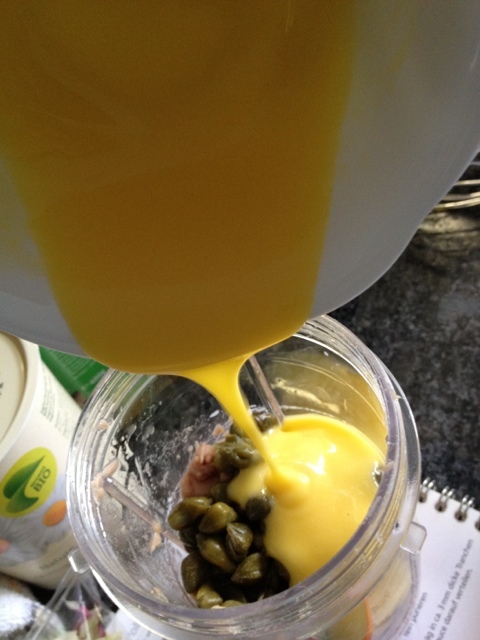 Slowly add 3 tablespoons of sunflower oil. 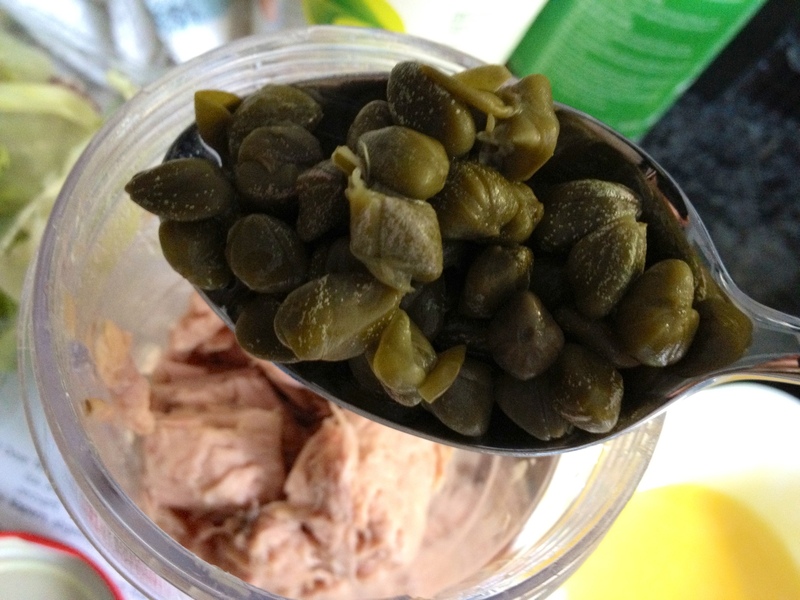 Add 1 drained tin of tuna (200g) and 2 tablespoons of capers. Even though it is not in the recipe I recommend you add 2-3 anchovies for extra flavour. 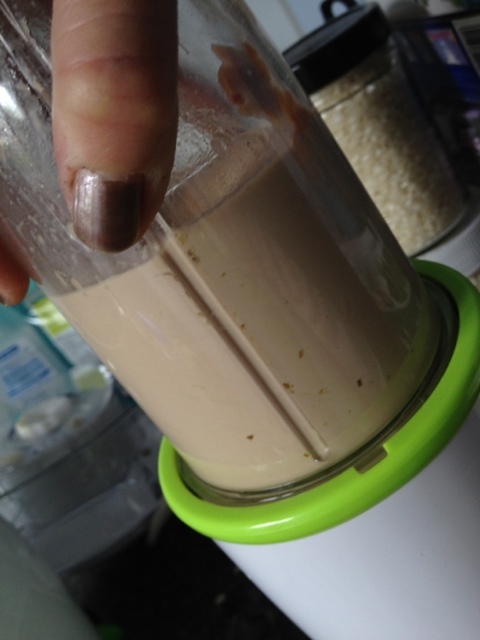 Mix all the ingredients for the sauce in a blender and season with pepper and if needed salt. (I don’t have dirty nails by the way, this is Chanel nail polish in Quartz… poor choice I just realize). 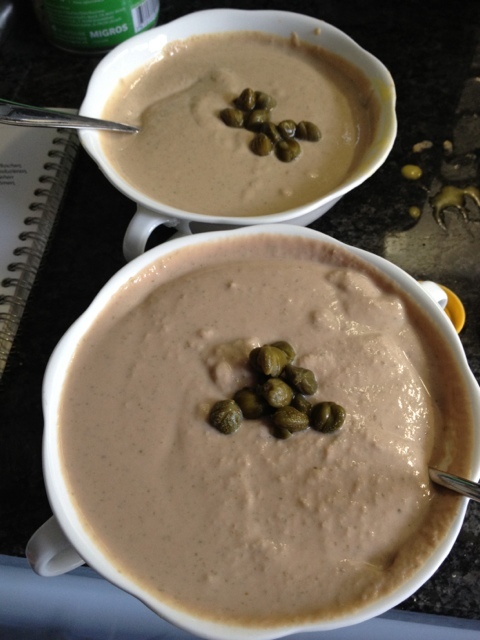 Betty Bossi also provides for a lighter version of the sauce based on yoghurt instead of mayo. 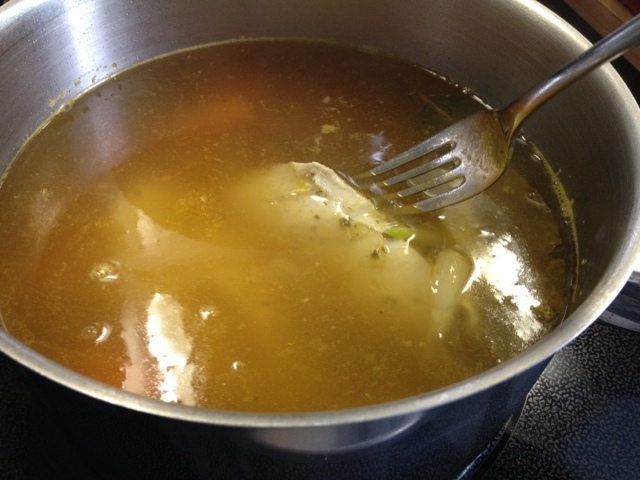 The rest of the ingredients remain the same and you add 1-2 tablespoons of the chicken/vegetable broth. Visually you couldn’t tell them apart. But only visually and it won’t come as a surprise to you when I tell you that the calorific mayo based sauce is tastier. But the yoghurt based one is a fairly good substitute. Once the sauce is done and the chicken cooked, all you need to do is plate up.